Three of the contenders to become Idaho’s next governor shared remarkably similar views Saturday on wildlife conservation, fishing, hunting and access to public lands. In questions posed at a forum at Boise State University, Democrat A.J. Balukoff and Republicans Tommy Ahlquist and Brad Little differed mainly on the handling of the state’s sage grouse management plan, and over the idea of breaching four Snake River dams in Washington state to recover endangered salmon and steelhead populations. The forum was sponsored by the Idaho Wildlife Federation and 17 other sportsmen and wildlife groups. Each candidate spoke separately for about 30 minutes to a crowd of about 100 people clad in flannel, jeans and camo. 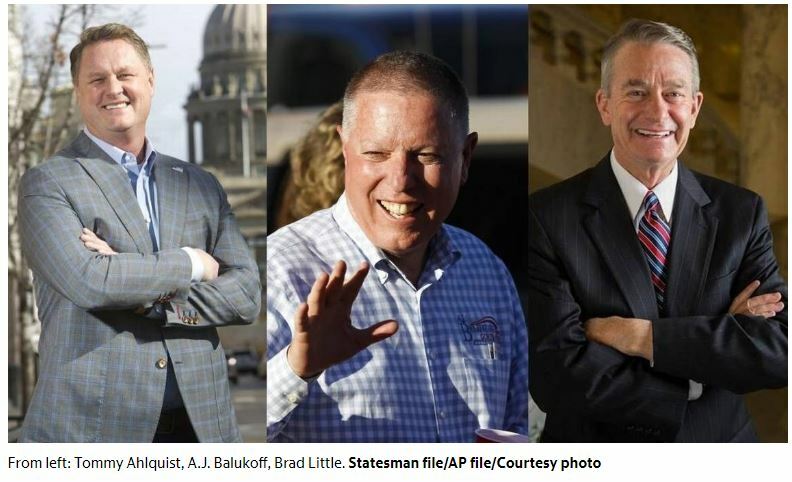 The three have quite different backgrounds: Little, a native Idahoan, is a longtime politician and rancher who currently serves as Idaho’s lieutenant governor. Ahlquist is a doctor, developer and political newcomer best known for recent Boise projects such as the Eighth & Main building. Balukoff is a CPA, businessman and longtime trustee on the Boise school board who ran unsuccessfully against Gov. Butch Otter in 2014. Absent among the leading candidates was Republican Congressman Raul Labrador, who declined to participate. That garnered a chorus of hisses and boos from the audience. Hunting and fishing: All three said they are outdoorsmen and hold Idaho hunting and fishing licenses. Ahlquist talked about fishing last week with his father-in-law. Balukoff discussed getting his annual wild turkey and a recent failed antelope hunt. Little recounted how for four generations, his family has held an annual upland bird hunt. Public lands: The candidates said they are not in favor of the state taking ownership of federal land in Idaho, mainly because it would be too cost-prohibitive. But they do want the state to have more of a role in how federal land is managed, and better public access to federal lands. Salmon and steelhead recovery: All agree the federal plan in play for the last 25 years is failing. Wildlife management: Political leaders need to listen to professional wildlife managers and biologists. And, all three said, the Idaho Fish and Game Commission should not be politicized. Endangered species: The candidates said we should follow the advice of biologists and wildlife managers to ensure that Idaho keeps sustainable populations to avoid federal intervention. The candidates did have a few differences on issues. Breaching Snake River dams: Ahlquist and Balukoff said they would consider it as a possibility. Little said he would not, but he would consider looking at how that water is managed, including adjusting flows or releasing more water over spillways instead of through turbines. Sage grouse: All agree that any management plan needs to be collaborative. Ahlquist and Balukoff do not support Idaho’s efforts to fight an Obama-era grouse management plan in court. Little said such an action sometimes is necessary if the federal government does not uphold its end of the deal. The entire 90-minute forum can be viewed on the Idaho Wildlife Federation’s Facebook page.